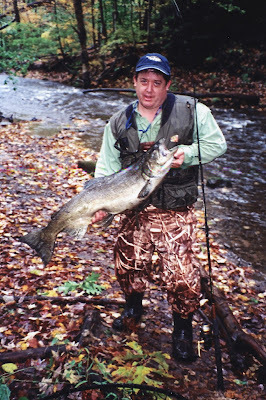 Salmon fishing amidst fall foliage… life is good! Last weekÃ¢â‚¬â„¢s torrential rains brought his words to mind. Since I havenÃ¢â‚¬â„¢t fished with the dude in years, and missed the good times, I got on the phone and asked him if he still believed in the old saying. So the next day found us at the stop sign on I-81 exit 36 in Pulaski, arguing about where we wanted to go. A string of cars began growing behind us. Before long they laid on their horns and Stash ordered Ã¢â‚¬Å“Take a rightÃ¢â‚¬Â¦take a right!Ã¢â‚¬Â We headed south on NY 13 for Pineville. At the crossroad we turned left onto Cty. Rte. 48. Below the old steel bridge, the Salmon River wasnÃ¢â‚¬â„¢t exactly raging and frothing, but it was close. About a mile later we pulled into the Trout Brook public fishing access site. The lot was almost full. One guy was heaving a limit of kings onto the bed of his pick-up. The fish averaged a solid 20 pounds. We no sooner reached the trail down to the stream and another guyÃ¢â‚¬â„¢s walking up with a huge king. He allowed me to photograph him. While posing, he talked: Ã¢â‚¬Å“My two sons are about a quarter-mile behind me, loaded down with a bunch of salmon. Hauling fish this size is like dragging deer,Ã¢â‚¬Â he laughed. Swollen by run-off to roughly twice its normal size, the brook had enough water for the kings to run without exposing their back–in most spots, anyway. Still, it was wadeable and bustling with activity. He landed it a couple pools later. When he went to get the hook out of its mouth, it struck back, sinking its canines into the flesh between his thumb and index finger. I guess the guy got the better part of that deal but you wouldnÃ¢â‚¬â„¢t know it from the water pouring off him and the blood dripping from his free hand. Right now the salmon run is going strong. In fact, the opportunities for catching one are better than ever. Autumn rains lure the fish into spots self-respecting salmon would never be caught in during low water. The best baits to use are raw salmon eggs or egg sacs. While itÃ¢â‚¬â„¢s uncertain why theyÃ¢â‚¬â„¢ll hit eggs, some think itÃ¢â‚¬â„¢s an attempt to destroy theyÃ¢â‚¬â„¢re offspringÃ¢â‚¬â„¢s competition. A smattering of browns and steelies are mixed in with them. Trout enthusiasts catch quite a few salmon on egg pattern flies and, surprisingly, on plastic worms like BerkleyÃ¢â‚¬â„¢s Trout Worms and Gulp Mini Earthworms. 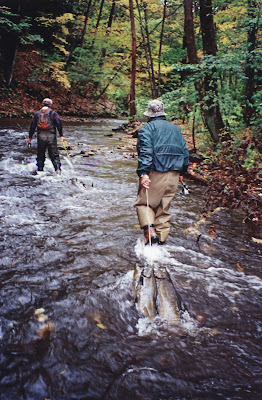 Good creeks to try, especially early in the morning or anytime after a hard rain, include Salmon River tributaries Trout and Orwell Brooks, Lindsey and Little Sandy Creeks which drain into Sandy Pond, and Grindstone Creek which feeds Lake Ontario at Selkirk Shores State Park. 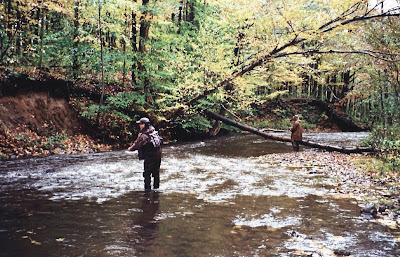 The Oswego County Hunting and Fishing Guide contains a map showing their locations.